The firm Schoffit is located in the east of Colmar, in a residential area where there used to be greenhouses. From here, the family Schoffit runs one of Alsace domains that have the most dispersed set of vineyards. Of the company's three vineyards Grand Cru Rangen is in the far south of Alsace, Grand Cru Sommerberg is in Niedermorschwihr, while lieu-dit Harth is squeezed between roundabouts, industries and modern buildings in Colmar's outskirts. 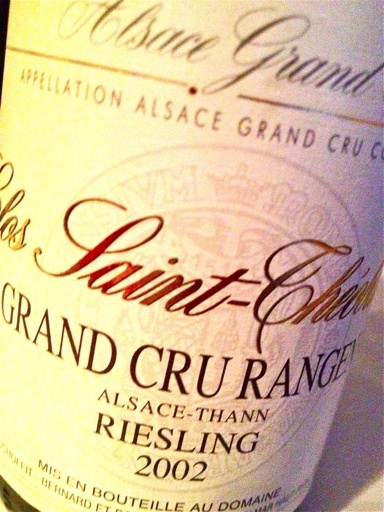 2002 Riesling Grand Cru Rangen from Schoffit in Colmar is deep golden yellow. The fragrance is explosive and expressive with exotic fruits, some rubber, smoke, mineral, roasted nuts and honey. The flavor is rich and deep, fresh and clean with beautiful youthful acid, lots of juicy fruit, a touch of tannins and an outstanding long finish. A perfectly mature wine of highest class. It is a priviligium to drink wines like these! Price: € 32.